The observatory offers you a chance to become familiar with telescopes, to take part in night observations and to attend lectures which will deal with a topic of your interest. The lecture hall has a seating capacity of 40 people. You can choose from a rich offer of special programmes, films, books and videos from the field of astronomy. Moreover, you can buy various astronomic materials, such as yearbooks, maps, postcards here and you can also take pleasure in a wonderful view of the town Hlohovec and its surroundings. The planetarium, with a seating capacity of 55 people, has a cupola on which you can watch the artificial sky, the Sun, the Moon, planets, the stars as well as the Milky Way in different seasons and various geographical latitudes, from the North to the South Pole. In the entrance hall, you can see the astronomic exhibition. 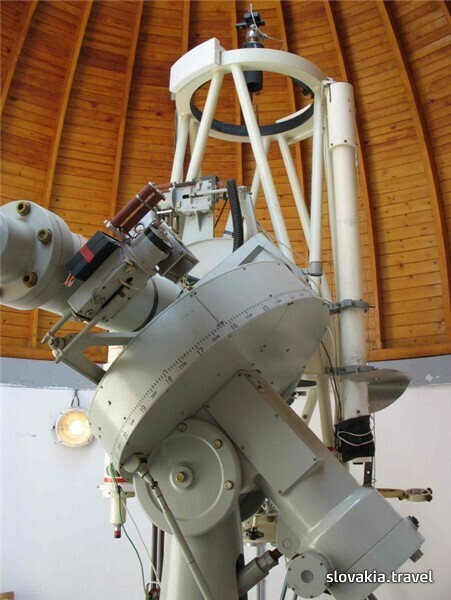 Take a chance to make astronomical observations and become familiar with the second biggest telescope in Slovakia. The date of a field trip must be arranged in advance. From May to December it is necessary to arrange the trip 14 days beforehand because a lot of groups are interested to visit our planetarium. Individual visitors have two days available; these days can be found on our website as well. The Homeland Studies Museum in Hlohovec is situated in the Franciscan Monastery from 1492 and it also includes the monastery canteen and the refectory with stucco decoration. Besides this, visitors can also see expositions of pottery, porcelain and glasswork as well as the collection of historical bells and stone sculptures. Located in the town of Trnava, Hotel Spectrum offers spacious accommodation with free Wi-Fi and contemporary design. It features a golf simulator and professional snooker table for guests’ entertainment. Café and restaurant. We organize family reunions, graduations, weddings, balls, receptions, banquets, seminars, training, team building, accommodation.